Here's an account of "John," who in 1980 wishes he would have bought cheap palladium and other metals during the PGM price surge of 1980. "I can remember it well. On the news every night the reporters would talk about how the palladium price and other metals increased in price. 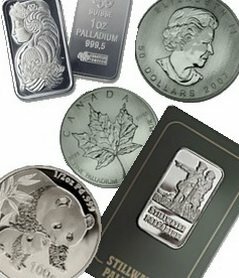 Cheap palladium was found everywhere a year before, now you couldn't even find cheap platinum or cheap silver. Most people wanted the gold, but there was a killing to be made in other metals, even moreso than gold. News reporters would stand outside of coin shops interviewing investors lined up to buy palladium bars, buy palladium coins, and buy all kinds of gold and silver. if you were to invest palladium a few years ago you'd have made a fortune. On the other hand you had the non-investors--the people who just wanted money--runing to cash in their palladium jewelry, platinum jewely, gold coins, and even sterling silverware! It was actually worth something now! Silver was $50/oz. FIFTY! Even if you factor IN inflation it has never been that high before.